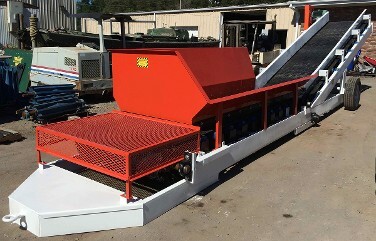 RadialStacker.com Drive Over Truck Unloaders are a Cost Saving, Efficient, and Inexpensive way to unload your material. We manufacture these Drive Over Conveyors for Aggregate, Coal, Grain, and Sand. We Specialize in Frac Sand Unloading Systems and Frac Sand Conveyor Systems and Frac Sand Stacking Conveyors. These site portable units combined with a Radial Stacker, are the most cost effective way to unload and store material available. Call us today for more information or a quote. Grain Unloading Units start as low as $43,400.00 USD. Call today for a quote on a stock unit. Custom Units and Double Drive Overs available. Double Drive Over available. These units are all portable and solidly built to handle the industrial environment. Watch Video! Site Portable - Tow in any direction. 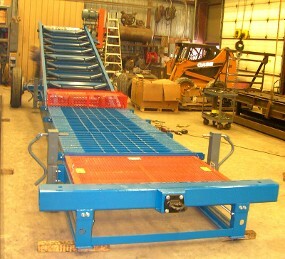 Ramps can be adjusted to customer specs. This is the End Dump Unloader. Sturdy, Low Hopper Entry Height, 24". "It unloaded our tri-axle salt trucks in under three minutes," Dave - Snow and Ice Management, Pittsburgh PA. Double Drive Over Grain Unloader. Put a Deposit on your new unit now as we are taking orders for 2018-19.